The best place to track form submission events is on your “thank you” page. Why? Because if someone has landed on your thank you page, it means they’ve successfully completed the form. They got past any client- or server-side validation. No oddball errors occurred. The event really happened. However, if you want to include all that rich form field data in the event you’re sending to tools like KISSmetrics, Mixpanel, etc., event tracking from the thank you page probably won’t work. The problem is that the custom redirect URL that these apps let you enter doesn’t receive any of the original form submission data. They could let you pass it in the URL’s query string args, but they don’t (and probably for good reason). Option #1 is to track the event on your thank you page anyway, and just leave out the form properties. This is fine if you only care about what happened and you’re not concerned with who did it. Of course you’ll have the who did it information in HubSpot or whatever application processed the form, but if you want to distribute that information to other tools, you’re kinda screwed. Option #2 is to track the event on the form page at the time of submission. This is the option I use. It’s trickier than it sounds, though. Think about it. You’re filling out a form and you click Submit, what happens? The page changes. So, your event tracking has to happen in the milliseconds after the button was clicked and before the page transitions. 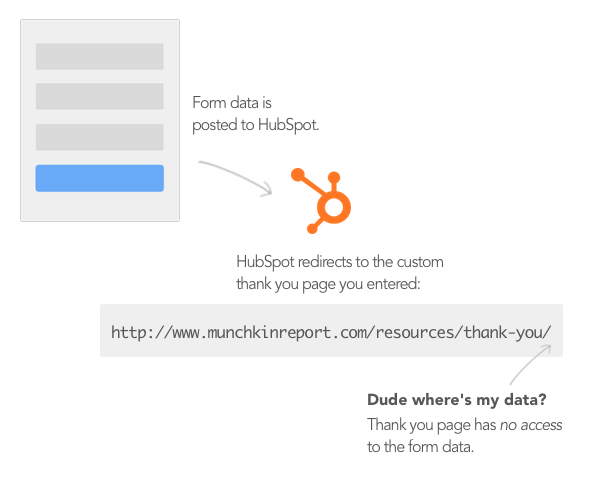 HubSpot landing pages, for example, use client-side form validation by default. If you forget to fill out a required field and you click the submit button, HubSpot will prevent the submission and display an error message, but the analytics code will kick in anyway. If the user bails out and never completes the form, your analytics will still show 1 form event instead of 0. If the user tries again and completes the form, your analytics will show 2 form events instead of 1. This can be a very bad thing. Trust me. I over-reported trial signups for MONTHS before realizing this. Segment’s trackForm helper will track the event as if it happened and submit the incomplete form. KISSmetrics’ trackSubmit helper will track the event but not submit the form. Mixpanel’s track_forms helper will track the event but not submit the form. Note: I filed an issue on Github about Segment’s helper because submitting a prevented form could be much more problematic than over-reporting events. All is not lost, people! jQuery provides a neat function, event.isDefaultPrevented(), that tells you whether a form submission has been prevented by someone else. All we have to do is check that value before firing the analytics events. The one BIG caveat is that your handler (i.e., line 5) has to be attached higher in the DOM than the page’s form validation handler because if your code runs before the form validation does, it’ll always run. The trick is to get your code to run last. Hopefully this helps people avoid the same issues I was having and, despite not being a perfect solution, perhaps some of the default helpers will try to incorporate event.isDefaultPrevented() to mitigate against false reporting. The tough thing is that there are a million ways to implement form validation, so it’s a cat-and-mouse game for the devs at KISS and Segment. For HubSpot landing pages, the isDefaultPrevented solution worked well…for a time. Then the forms team at HubSpot decided to call preventDefault always, even if the form was completely valid, presumably because they’re submitting the form via AJAX. Pssst…are you a HubSpot user? Mastering HubSpot is the most extensive and detailed guide of advanced HubSpot techniques and best practices available today. This course is crammed with practical, immediately actionable things aimed at making you wildly successful with HubSpot.